Oh Hey There! : Soap and Glory One Heck of a Blot Instant Perfecting Power Primer. Soap and Glory One Heck of a Blot Instant Perfecting Power Primer. My skin is very extreme combination, made up of both very dry and very oily patches. Whilst I very much need a primer, finding the right one can be tricky, especially within the past few months when my skin has become a bit of a nightmare! I have been having a lot of trouble with my makeup both disappearing but also clinging to the drier areas and haven't really found anything to counteract this, meaning my skin has not been looking it's best. Until about a week ago, in Boots, when I was looking at the Soap and Glory stand and noticed the One Heck of a Blot Instant Perfecting Power Primer. It is not a product I had ever noticed before and I am pretty sure is a new release for A/W 2015. As a huge fan of Soap and Glory products, I knew I had to give it a go! I have never been disappointed with one of their products and this little gem is no different! It has really been helping create a better base for my foundation/concealer and I am very grateful! Since using it, I have definitely noticed my makeup staying in place longer. A few people have even commented that my skin has been looking good, which never happens! I have been noticing my makeup staying a lot longer and neither fading on those oilier areas, nor clinging to drier ones. It seems to be really getting the balance just right between not being too drying and keeping excess oils at bay. It has a slightly creamier, thicker texture than a lot of primers I have used before, which I really like. Because its creamier, it is very smooth but doesn't feel too silicone heavy. It applies a bit like a moisturiser actually, sinking in a little but still leaving a smooth layer on my skin. The only downside with this product is that because its not as siliconey (not a word I know), I did find that I needed a little more than I have with other primers as it didn't spread quite as far. I am a little concerned about how quickly I will run out but I do think this is hugely outweighed by how lovely it is to use, feels o the skin and how well it works. 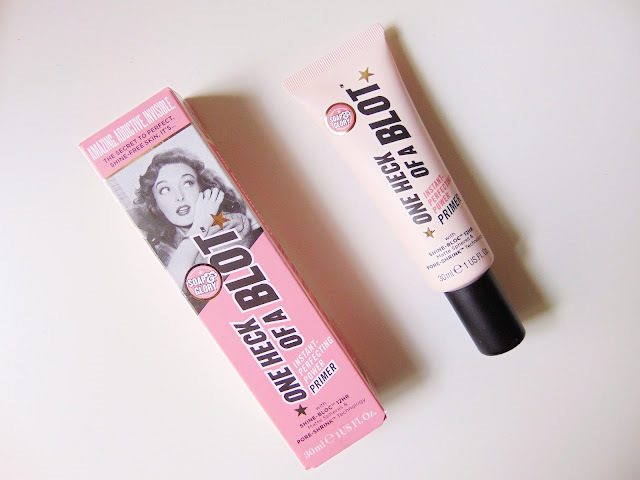 Have you tried the Soap and Glory One Heck of a Blot Instant Perfecting Power Primer?